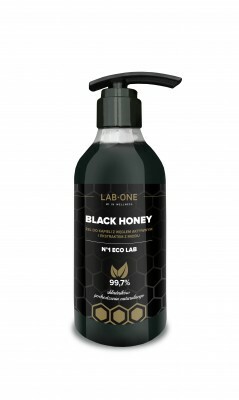 BLACK HONEY bath gel with activated carbon and honey extract is a unique product composed of natural ingredients and delicate substances for cleansing and skin care. Bath is one of the most pleasant moments of a home SPA. It allows you to relax, relax and mute, and at that time the natural ingredients of BLACK HONEY thoroughly cleanse and regenerate your skin leaving it velvety smooth and nourished. The product is ideal for daily care. Unique ingredients for your skin! Activated carbon perfectly copes with attracting and absorbing toxins, impurities from the skin, excess sebum or keratinized epidermis. In addition, it has antibacterial, anti-inflammatory, brightening and soothing effects. Honey extract moisturizes the skin, maintains its moisture level, soothes irritations and removes dead skin cells. It improves skin tone, making it smooth, soft and flexible. An additional advantage is that honey adds energy, and thanks to the routine contained in it, allows for better absorption of vitamin C, which strengthens the blood vessels, improving blood circulation of the skin. Polysaccharides are complex sugars that are one of the basic building materials of living organisms. Included in the product form an occlusive layer that prevents water loss and cracking of the skin. Inulin makes the skin smooth and pleasant to the touch. Safety and effectiveness of use. The team of qualified specialists who supervised the entire production process worked on creating excellent LAB ONE cosmetics and developing their recipes. All LAB ONE cosmetics have been subjected to application, apparatus and laboratory tests in an accredited laboratory. Under the supervision of the Safety Assessor and technologists, the physicochemical and microbiological stability tests have also been passed. To limit the occurrence of irritation, dermatological tests were also performed. Modern connections and specialist knowledge have helped create the cosmetics of tomorrow that you can feel on your skin today. Composition: Aqua, Cocamidopropyl Betaine, Lauryl Glucoside, Glycerin, Inulin, Alpha-Glucan Oligosaccharide, Charcoal Powder, Mel Extract, Propanediol, Citric Acid, Sodium Benzoate, Potassium Sorbate, Parfum. Usage: Apply a small amount of the product on wet skin, gently massage and then rinse with water. 1. How does the Black Honey gel work? Active carbon contained in the product thoroughly removes impurities and supports skin regeneration processes. Honey extract causes the skin to be nourished and full of radiance. Polysaccharides contained in the product form an occlusive layer that prevents water loss and cracking of the skin. The unique properties of inulin make the skin smooth and pleasant to the touch. 2. How should you use Black Honey Gel? Apply a small amount of the product on wet skin, gently massage and then rinse with water. 3. Who do we recommend Black Honey gel especially for? Black Honey bath gel is the perfect solution for every person who wants to provide the skin of his body with softness, long-lasting hydration and smoothness. 4. What distinguishes Black Honey from other products of this type available on the market? LAB ONE want to ensure the maximum effect of active ingredients contained in cosmetics, has opted for the technology of the future. LAB ONE products use the power of water with very small particles of 1 nanometer size. Thanks to this, the molecules effectively penetrate the deeper layers of the skin, which ensures better absorption of active substances and their effectiveness. 5. What is the proof of product safety? A team of qualified specialists who supervised the entire production process worked on the formulation and creation of the product. Under the supervision of the Safety Assessor and a technologist, it has also undergone physical, chemical and microbiological stability tests. To reduce the occurrence of irritation, dermatological tests were also performed. 6. What is the composition of Black Honey?